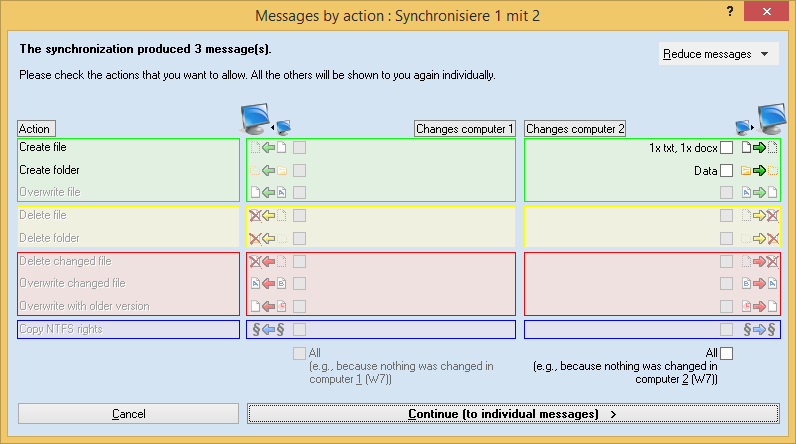 When you’re synchronizing a task, it may happen (depending on the options and file operations) that Easy2Sync has some questions. You have three possibilities to handle these questions. You can see for every category how many files are affected, their suffixes (e.g., 'doc') and where the changes will take effect. (At location (1) or (2)). If you check category then all files in this category will be synchronized this time without further questions. For all categories that you don’t check (even though they could be checked), the respective questions will later appear in the dialog Synchronizing a task. In that dialog, you have two more possibilities to handle them. Tip: Hold the mouse cursor over a checkbox to see a list of a few affected files. Hold shift while clicking on the checkbox to see a complete list.